This is a one of a kind project we completed in West Chester, PA, during the summer of 2017. 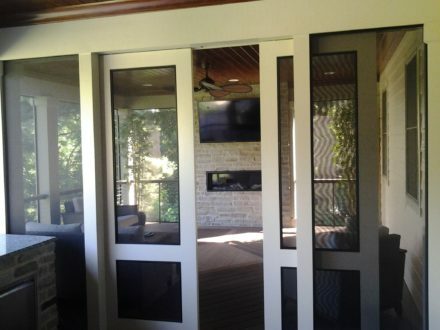 From the screened-in-porch with a fireplace and sliding doors to the open porch with a full outdoor kitchen, each detail made the project special. Serving as a great entertainment space, the full outdoor kitchen is equipped with an ice-maker, trash pullout and fridge, and two grills. The curved steps lead to a lower deck area with a compass design that we built into the deck. The deck with cable railing also adds a unique feature.